The Green Bay Packers Lower South End Zone is a new section renovated as part of the recent construction at Lambeau Field. The Lambeau Field seating chart shows the Lower South End Zone above the Upper Level and below the Miller Life Lounge. Green Bay Packers Lower South End Zone seats are located in 400 level sections above the south end zone on the same level as the Miller Lite Party Deck. Thirteen individual sections make up the Lower South End Zone: Section 432S, Section 434S, Section 436S, Section 438S, Section 440S, Section 442S, Section 444S, Section 445S, Section 446S, Section 447S, Section 448S, Section 449S, and Section 450S. Every seat in the Lower South End Zone provides a reasonable view of the entire field. The height of the 400 level ensures that fans can see most of the game near the close goal line and adds perspective to watching the action on the opposite half of the field. Fans sitting in the back rows of Lower South End Zone sections may have fully obstructed views to anything occurring within the close end zone itself. Fans sitting in the front rows will have a good vantage point for the entire field of play. Packers Lower South End Zone tickets are only sold as full season tickets of ten games including two preseason games. 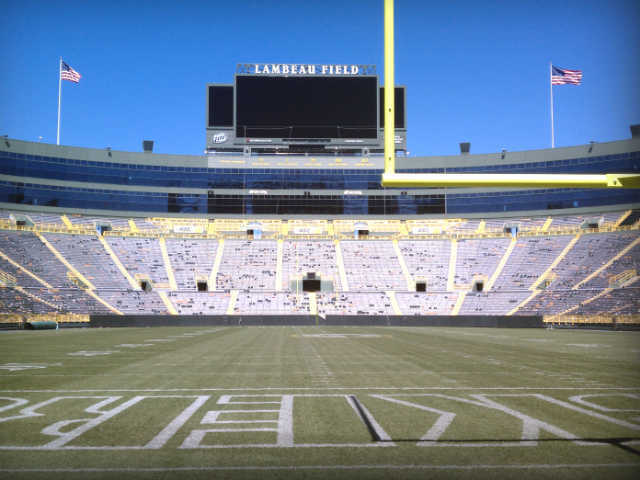 With a long wait list for Packers season tickets, fans looking to purchase Lower South End Zone tickets will not be able to find any tickets directly from the team. For the best chance of individual game Lower South End Zone tickets, look to secondary market ticketing websites and independent Packers ticket brokers. Prices vary dramatically, but every regular season game sells for more than face value for a popular venue such as Lambeau Field.